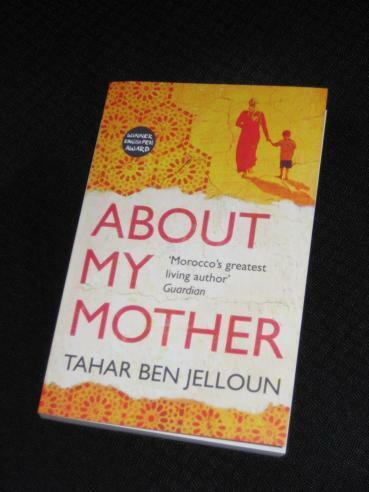 Tahar Ben Jelloun’s About My Mother (translated by Ros Schwartz and Lulu Norman, review copy courtesy of Telegram Books) does exactly what you’d imagine from the title. A son’s tribute to his dead mother, Lalla Fatma, the book shows her lying in her bed in the family home in Tangier, on an inexorable descent towards the grave. As her memory starts to play tricks on her, Fatma spends more and more time in the past, revisiting her early life in Fez, including her three marriages and the brief interludes of widowhood, as well as taking the reader through the local bathhouse and describing her first wedding. Life slowly gives way to death, and the loving, nostalgic style of the first half of the book is slowly replaced by a darker, more regretful tone. As his mother’s condition deteriorates, the difficulties of caring for her increase, and her writer son Tahar does his best to see and talk to her as much as possible, despite living in France. As he does so, he attempts to prepare himself for his mother’s death, and with it the loss of the last link to his past. Small, ailing and frail at times, she’s also warm and generous, a woman happy with the life she’s led despite the many setbacks she’s faced along the way. Fatma calmly slips between past and present, the two coexisting peacefully in her mind, and as she moves through time, her son becomes her brother, or perhaps her father, one of many visitors from her past. Tahar accepts this state of affairs and is able to cope fairly well, but some family members struggle with Fatma’s inability to recognise who she is talking to. While those around her struggle to cope, she only wishes for a clean, bright house for her funeral guests. Perhaps it’s for the best that her faculties are failing her as, sadly, the house is falling apart in the same way as Fatma’s health is declining. Another interesting aspect of About My Mother is the way the writer examines cultural differences in the background. He introduces another elderly lady, the mother of one of his friends, and while she is rich and in relatively good health, she comes across as a contrast to Lalla Fatma in other ways too. Her son is not a frequent visitor, and with no extended family around her, she would be quite happy to move somewhere to be cared for (unthinkable for the Moroccan family). It’s not just the fact that she’s a Thomas Bernhard reader that makes us think that she’s not quite as happy as we might first assume. Overall, About My Mother is a beautiful read, an elegy to a woman and an insight into another culture and a lost time. I’m sure I’m not the only one to find all this fascinating – some parts would perhaps be as alien to modern Moroccans as to Anglophone readers. My only previous taste of Ben Jelloun’s work, The Happy Marriage, was a biting satire, a nasty ‘he-says, she-says’ confrontation of a novel. Here, he uses another tone entirely, but it makes for a book which is just as successful and rewarding to read. I’ve also read one previous Ben Jalloun novel, The Blinding Absence of Light. I didn’t dislike it, but obviously didn’t like it enough to read more. From what you say, though, it sounds like his books might differ considerably. He was in Edinburgh this year talking about About My Mother but unfortunately I wasn’t able to see him. Grant – I was only introduced to his work after being asked to write a review for WWB. I wouldn’t say either of the two I’ve read would make you want to look for all of his work, but they were both excellent, well-written novels, and I could definitely see myself trying another at some point.